Sometimes we follow people we don’t even know. We see someone on a movie or in a video game or hear them in a song and we try to copy what that person says or how they think. We think they’re cool so we try to be like them. Unfortunately, sometimes the leaders we follow aren’t very good ones. For example, if our friends are making fun of someone, we don’t want to follow them. Or if someone on a movie is talking back to their parents or cheating on a test, we wouldn’t want to follow them either. In fact the Bible shows us there is one leader worth following above all others. His name is Jesus, and he invites all of us to follow him. We do that by learning about his life in the Bible, spending time talking to him and asking him to help us copy his example. If we see other people follow Jesus and do the things he would do, we can copy them too. When we follow people who truly follow Jesus, we’re all just following him together. A friend of Jesus named Paul once wrote, “Follow my example, just as I follow the example of Christ” (1 Corinthians 11:1 NIrV). Everyday we face choices about what we will think, say and do. The more time we spend with Jesus and hang out with people who love Jesus, the easier it is to choose to be like him. Over the next several devotions we’re going to see that following Jesus is the best way to live. When we jump in with Jesus, he will lead us on an amazing adventure. Jesus will show up in our lives in unexpected places and lead us to do things with his power we could never do on our own. Sure, every day won’t be exciting or easy, but we can trust our leader Jesus to lead us to where we want to go. Have you ever played Marco Polo? How did you do at following your friend’s voice? Are there any friends in your life or famous people you admire who are setting a bad example that you shouldn’t copy? What are some things the Bible teaches us about Jesus that he could help you copy this week? Who are some people who follow Jesus who are good examples to follow? Jesus, you are the best leader ever. Please show me how to follow your voice and your example this week. Amen. Who’s influencing your life right now? Is it your circle of friends? Your family? Maybe just things you’re watching, reading or listening to for fun? Would say your influences are leading you closer to Jesus or farther away from him? Do you see the life of Christ in them? If not, what influences do you need to dial out and where can you find others who will lead you closer to God? Like it or not we are the biggest influences in our kids’ lives, and we need to think about the example we’re setting for them. Where do they see Jesus in us? What are we thinking, saying and doing that will lead them closer to him? We don’t need to be perfect examples, just sincere examples of following Jesus so our kids can see the life of Christ in us. Don’t miss out. 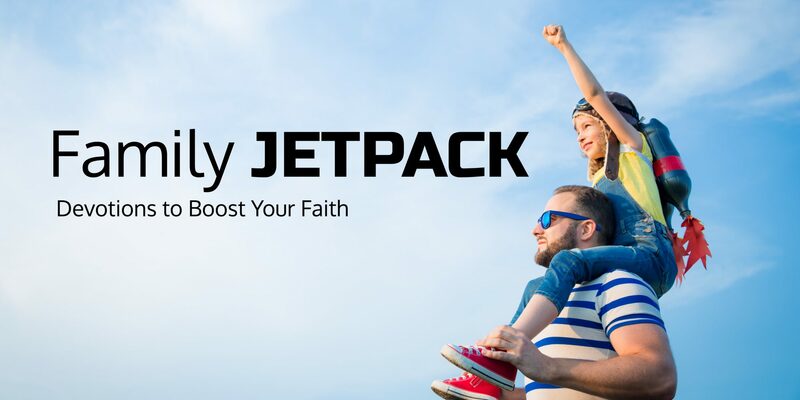 Sign up for the Family Jetpack newsletter to get family devotions sent straight to your inbox.